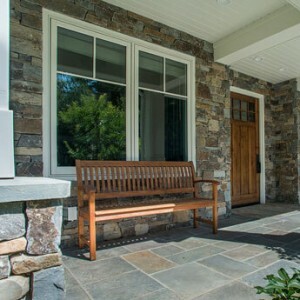 So you might be asking what is Thin Stone Veneer? 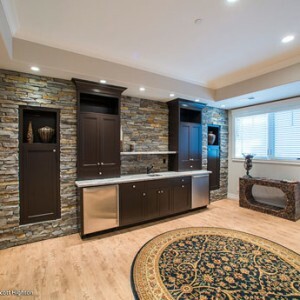 Thin stone veneer is a product created from natural stone. The stone is cut to a thickness of roughly 1.5 inches. This stone product is sold in flats and corners. Thin stone veneer has many varieties: ledge, ashlars, roughly square roughly rectangular, and mosaic. These categories refer to the size and the shape of the natural stone. Ledge stone is typically sized from 1 inch in height to 3 inches. Length can range from 3 inches to 16 inches. Ashlars are 5 inches to 10 inches in height and 5 inches to 20 inches in length. Roughly square roughly rectangular can have square sizes ranging from 5 inches by 5 inches to 12 inches by 12 inches. The rectangular pieces can range from 5 inches in height and 16 inches in length to 10 inches in height and 20 inches in length. Mosaic shapes can have round sides, pointed sides, and square sides. Mosaic stones can range in size from 3 inches to 20 inches. These stones have very organic shapes. Corners are what make this product so fantastic. They are also 1.5 inches in thickness on average. Corners are made from whole rocks that have had the middle cut out of them on right angles. They typically have a short face; usually 2 or 3 inches and a long face which can vary in size from 5 inches to 12 inches. Corners stacked in conjunction with flats create a beautiful veneer on house exteriors or interiors. Corners give a veneer a feeling of thickness and depth. Thin stone veneer is applied to a properly prepared surface with high bond thinsets. This veneer does not require a load bearing foundation. Which make it ideal for any residential or commercial application? It can be used as a decretive accent in kitchens, bathrooms, bar areas, and of course large or small fireplaces. It is also an excellent product for all exterior applications. 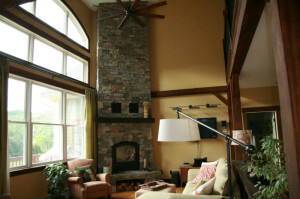 Thin stone veneer is a maintenance free product for the live or your home or business. This entry was posted in Masonary and tagged Custom masonry, stone accent wall, stone chimney, stone hearth, stone landing, thinstone. Bookmark the permalink.